We've Got Olympic Spirit, Yes We Do; How 'Bout You? July 31, 2012  The London Games have conspicuously defied traditional notions by having cheerleaders, in a few different styles, at a few different venues. In basketball, dance teams perform between matches. In beach volleyball, highly choreographed teams delight attendees. July 31, 2012  The U.S. men's swimming team has won the 4x200m freestyle relay, in a race that also gave Michael Phelps a record 19 medals in the Olympics. He netted his 18th, a silver, earlier in the day. Also netting a gold was American Allison Schmitt, who won the women's 200m freestyle. July 31, 2012  U.S. gymnast McKayla Maroney took the floor on Tuesday to tackle the event that can make or break Team USA in just a fraction of a second. It's the vault. And Maroney has the approval of the man who's been on the mat for so many memorable vault moments — Bela Karolyi. Audie Cornish asks Karolyi about the pivotal moments that can make or break success in the event. July 31, 2012  The U.S. women's gymnastics team has won the team gold medal at the London 2012 Olympics, handily beating Russia, which took silver, and Romania, which took bronze. China finished fourth. 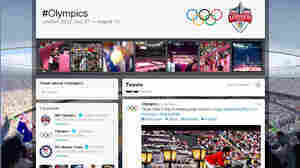 July 31, 2012  The London 2012 Games have been touted as the first Olympics to live fully in the age of social media. 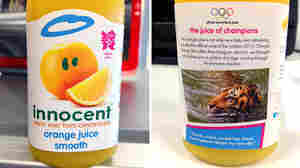 But a rash of scandals related to Twitter has put a new mark on the face of the London Games. The stories range from a journalist's suspended account to a tweeting teen who has been arrested. July 31, 2012  Equestrian sports are getting more attention than usual at this year's Olympic Games. NPR health policy correspondent Julie Rovner, a horse owner, rider and competitor, talks about what to watch for in the Olympic horse sports. 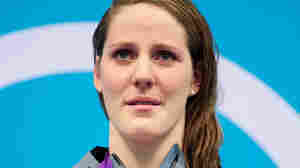 July 31, 2012  Swimmer Missy Franklin, 17, is being hailed as the next great U.S. swimming star, after winner her first gold medal in the London Olympics. She says that while standing on the podium, she thought about "all the things leading up to that moment. And it was so incredibly worth it." July 31, 2012  Okay, so let's admit one thing: all Olympic events are pretty much worth watching. But there are just too many of them — so here's a list of big events we'll keep an eye on today. July 31, 2012  Stories that caught our eye this morning include a ratings coup for NBC, progress for Venus Williams, and a 33-megapixel broadcast of the opening ceremony. July 31, 2012  The latest results and what's coming up at the Olympic swimming pool in London — including another shot at Olympic history for American Michael Phelps, and a missed medal for his teammate Ryan Lochte.